Swedish audio maker JAYS has launched its latest pair of Bluetooth enabled wireless headphones – the JAYS m-Six Wireless in India at a price of Rs.7,999. The gadget comes with a thin neck wire as against a neckband. The m-Six wireless headphones are available for sale in India across all major e-commerce portals. As per the company, the m-Six Wireless is “designed with the inside surface of a typical ear to optimize the inside earphone volume and to keep the earphone securely in place,”. This confirms the activity-oriented approach adopted by the company while conceptualizing these headphones. The m-Six Wireless is powered by 6mm dynamic speakers. As for its connectivity, it uses Bluetooth 5.0 with Qualcomm’s aptX Low Latency codec which improves ease of connectivity, range, and latency of audio transmission. The device, thus, enables wireless transmission of high-resolution audio. The earphones sports standard specifications of audio which include 16Ω impedance and 10Hz – 20,000Hz frequency response. The earphones can connect with up to two devices simultaneously due to support for multi-point connectivity offered due to the presence of Bluetooth 5.0. The JAYS m-Six Wireless Activity headphones come with up to five hours of rated playback time. It is also equipped with fast charging standard that charges up to 75 percent of the battery within 45 minutes. As for its build, it has a rubberised body and a metal inlay with branding which also doubles up as a multi-function button. This button is provided to facilitate multiple earphone functions, which includes the power on/off, pairing, play/pause, force pair and for using the voice assistant on the user’s phone. The earphones are available in dusty rose, moss green, sand and black colour variants, with a matte texture on the outside. 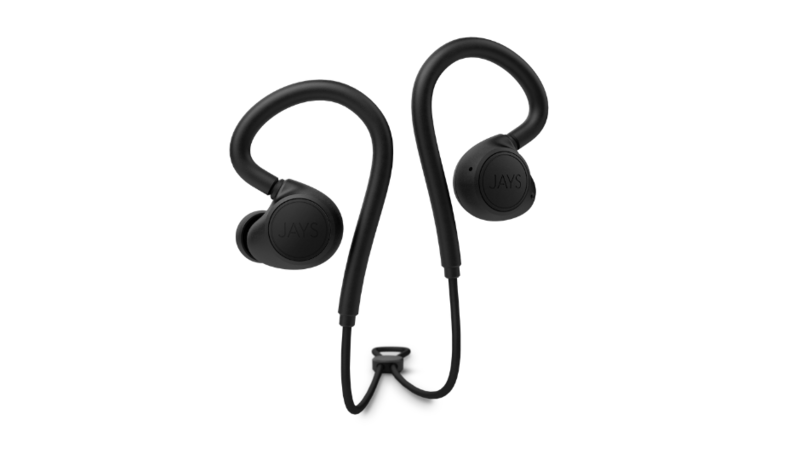 JAYS’ m-Six Wireless Activity headphones use a neck wire that is light, short and non-intrusive in comparison to neckbands. While the brand has a certain recall and the company has a reputation for offering premium audio quality, the Bluetooth enabled earphones will have to compete with a host of truly wireless earbuds from local audio manufacturers that have recently flooded the Indian market. The market in India is also seeing an increase in demand due to easy and ubiquitous availability and customer friendly pricing of Bluetooth 5.0 modems.